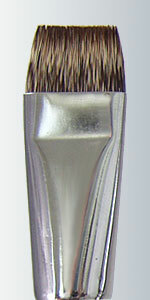 A natural hair brush especially suited for oil painting. Also called a Square Shader. This short hair Shader works well for rouging or moving oils for blending. 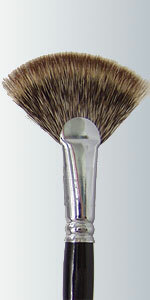 A natural hair brush especially suited for oil painting. This Flat holds enough paint to do florals or landscapes with ease. Has a stiffness which moves oil, but is very soft for that soft finish. 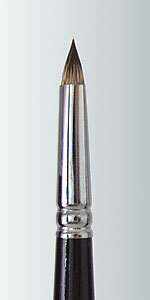 A natural hair brush especially suited for oil painting. This short hair Spotter is perfect for moving oil on the face, as in portraits or in other small areas especially on canvas. 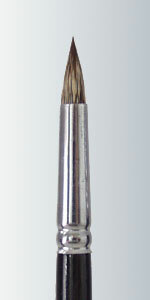 A natural hair brush especially suited for oil painting. This Pointed Round is good for all your scrolling and line work. Works well to paint florals and landscapes. 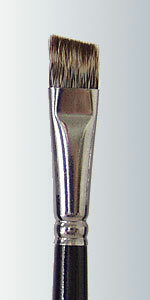 A natural hair brush especially suited for oil painting. 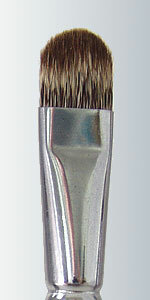 This brush is a favorite of animal and landscape artists on canvas. Its rounded edges give the perfect soft touch. 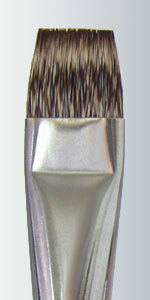 A natural hair brush especially suited for oil painting. This Angle can be used to paint florals or landscapes. It is really nice in small areas where the point of the angle is used. A natural hair brush especially suited for oil painting. These natural hair Fans are good for blending backgrounds and painting textures such as on trees, barns, grass, fur, and feathers.